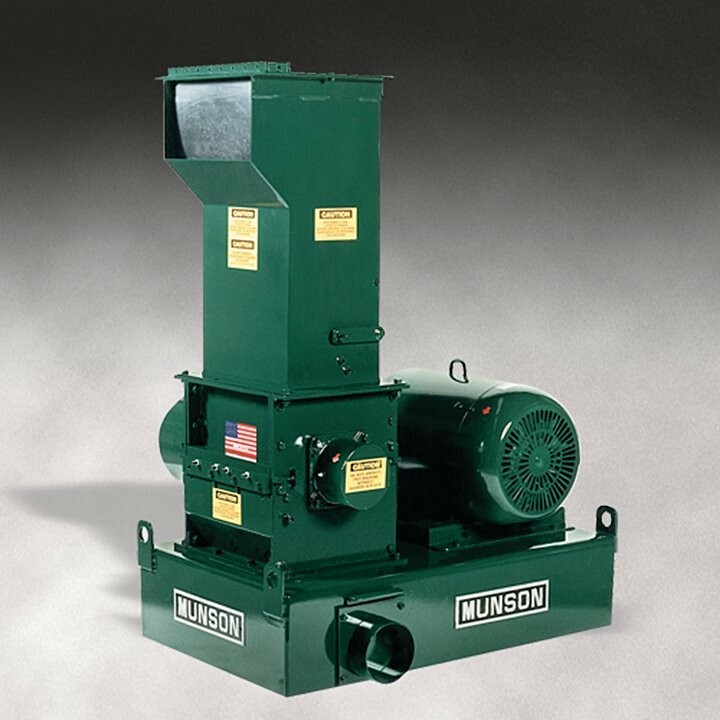 The Munson Screen Classifying Cutter Model SCC-15 reduces fibrous cannabis stalks and bulbs into compost-ready particle sizes at high rates. With an infeed throat of 15 x 11 in. (381 x 279 mm), this heavy-duty cutter features an 11 in. (279 mm) diameter rotor with dozens of cutter heads attached to a helical array of staggered holders called "interconnected parallelograms" that continuously shear oversize cannabis materials against twin, stationary bed knives. Unlike conventional knife cutters that slice material in scissor-like fashion, the SCC Cutter is configured with carbide tipped cutter heads along the entire shaft, with no gaps between tips, making total contact with the product. Operating at set speeds from 30 to 3600 RPM, the unit can process at high rates with minimal fines and little or no heat generation. Bed screen perforations range from 1.5 in. (38 mm) to 0.0312 in. (0.79 mm) in diameter, allowing the reduction of material into uniform particles in sizes down to 1/8 in. (10 mesh). The SCC-15's proprietary helical rotor design contains dozens of carbide tipped cutter heads attached to a helical array of staggered holders that continuously shear cannabis stalks and bulbs against twin, stationary bed knives. Cannabis stalks and bulbs are fed through the top of the intake chute, which is double-baffled to prevent flashback, or directly into the front of the cutter through a hinged door. Discharge is via gravity or pneumatic collection. The cutter tips, which are secured with one retaining Torx head screw for rapid replacement, are supplied as standard in tungsten carbide and available in various grades of tool steel and hardened stainless steel. Other SCC Cutters offered by the company range in size from Mini Cutters (4 in. [102 mm] diameter cutter head) to Magnum Cutters in lengths to 72 in. (1842 mm) and are configured with multiple V-belt drives as standard, or optional direct-coupled gear-reduced drives. All models are offered in carbon steel, abrasion-resistant steel and stainless steel.